This was inspired by an undergraduate named Harvey Pendell Meyers, who knows a heck of a lot about ECGs. How is that possible, as an undergraduate (like, not yet in med school)? You've got me on that one. But he sent case 5 which inspired this whole post. WPW has abnormal depolarization through a bypass tract, manifesting as a delta wave. And like other ECG abnormalities that have abnormal depolarization (LVH, LBBB, RBBB, Brugada, hyperkalemia, and others), they also have abnormal repolarization. "Secondary repolarization abnormalities." (Not primary, meaning the QRS is normal but repolarization is abnormal, as in ischemia). Cases 1-3 are of WPW with secondary repolarization abnormalities that could mimic old or acute MI. Case 4 shows a baseline WPW, then with MI superimposed on it. Case 5 is a case in which WPW conceals acute MI. WPW Mimics old inferior with acute posterior MI. Note that there are Q-waves in II, III, aVF and that the T-wave in these leads is upright. In a study of 50 patients with inferior Q-waves due to WPW, 47 had an upright T-wave. The author, Ary Goldberger, suggests that in the presence of a delta wave and Q-wave, the T-wave should be discordant (opposite the Q-wave) as it is in this case, or at least isoelectric. He suggests that if it is concordant, then one should suspect inferior infarction. Accordingly, lateral QRS and T-wave should also be discordant. WPW in this patient with Ebstein's anomaly (post conversion for a fib with WPW) looks a lot like LBBB with anterior STEMI, but also with concordant T-waves in inferior and lateral leads. There is no definite Q-wave here, so one cannot apply Goldberger's rule. Nevertheless, it is interesting to note that in limb leads, QRS and T-waves are concordant whereas in precordial leads they are discordant. Other than the study on inferior Q-waves and its implications for diagnosis of inferior MI, I know of no other studies assessing this phenomenon. I am not sure if, in WPW, there is a predictable pattern. Are the QRS and ST-T complex normally concordant or discordant? Not sure. Anterior ST elevation is due to WPW, not anterior STEMI. It does look somewhat like LBBB. Diffuse repolarization abnormalities are all due to WPW. 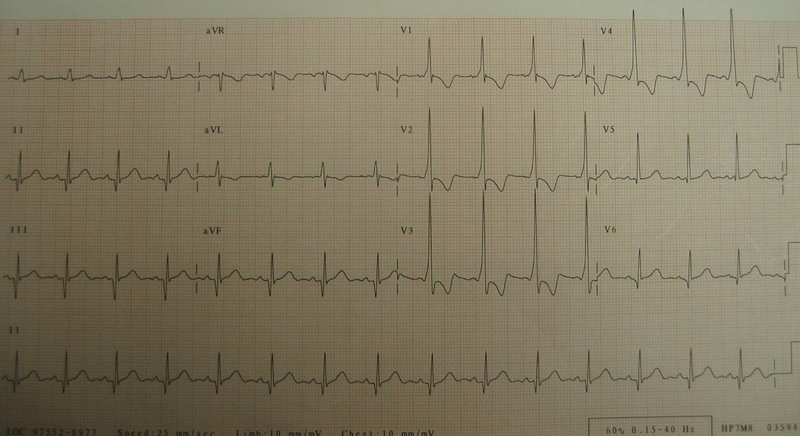 ST segments are generally discordant here and T-waves are concordant. This one has deep Q-waves in inferior leads with some minimal ST elevation and reciprocal depression in aVL. The T-waves are inverted, suggesting perhaps old MI? One might be tempted to attribute the ST elevation in II, III, aVF, and reciprocal ST depression in I and aVL, and ST depression in V2, as due to WPW. But this is excessive ST deviation for WPW. This is inferoposterior STEMI superimposed on the WPW. Having the old ECG (the one above) makes the diagnosis of acute inferoposterior STEMI easy. Now you're ready for Case 5. A patient with onset of chest pain at 4AM presents to the ED at 0519. Clearly there is WPW, with short PR interval and delta waves. There are deep QS-waves (negative delta waves) in III and aVF, with concordant T-waves. T-waves are upright in I and aVL. Is there old or new inferior MI? There is ST depression in V3-V6. There are nonspecific ST and T-wave findings in V4-V6. Are these all due to WPW, or is there something hiding? Neither of these ECGs, in my opinion, clearly show ischemia because WPW can so often mimic ischemia. However, perhaps simply because of worrisome symptoms, or perhaps because they were unaware that these ST-T repolarization changes can be entirely due to WPW, the clinicians took the patient for an angiogram, which showed a 95% stenosis of the first diagonal with TIMI 2 flow. It was stented. Many T-waves are now flattened or inverted since the last ECG. Inferior T-waves are now clearly upright, lateral T-waves clearly inverted. So these discordant T-waves in III and aVF, and I and aVL appear to be the normal discordant T-waves that one finds when there are inferior Q-waves due to WPW. This appears to be a case of pseudonormalization of T-waves, but it is not true pseudonormalization because it is not from re-occlusion, but rather from reperfusion. In other words, after reperfusion, the T-wave vectors are in the expected direction for WPW, not inverted from normal as is common in reperfusion. QRS is normalized except for Q-waves in I and aVL (due to the lateral AMI suffered on this occasion). Interestingly, the T-waves are inverted in III and aVF, but not in I and aVL; that is to say that there are apparently no lateral reperfusion T-waves. There are large T-waves in V2 and V3 which may represent posterior reperfusion T-waves (or early repol, but without a comparison from prior non-WPW ECG, this is uncertain). 1. WPW alters both depolarization and repolarization and can both mimic and obscure acute MI. 2. In WPW with inferior Q-waves, the T-wave is usually upright (discordant). 3. In WPW with inferior Q-waves, a concordant T-wave should raise suspicion for MI, either old or new. 4. I am uncertain as to whether there are other concordance and discordance rules that may help decipher ischemia in the presence of WPW. Bravo to your student ! very good observer... It could be a case report for a review. Another pont may be to use caution when analysing serial ECGS for differing amounts of preexcitation via an accessory pathway or pathways. Ah yes my pont,....... I mean point. I haven't read much on the subject but in clinical experience I have found that on differing ECG samples of an individuals QRS and ST/T show varying amounts of deformation. This indicates that the pre-excitation of the ventricular mass may be more or less during difffering ECG samples. When analysing serial ECGs and looking for greater deformation of ST segs and T waves it is wise to keep in mind that in the setting of WPW that they can be deformed further by the differing activation of the ventricular mass. Also patients with WPW often have more than one pre excitation pathway and varying ventricular activation via a different pathway will also deform the QRS ST T in various ECG samples. In inferior leads there are Q waves but the PR interval is normal (cca. 140 ms). My intuition tells me that if in a lead there is a delta wave there should also be short PR (as in V1-4). What do you think, Dr. Smith? How do we know if the ST depression in V2-3 are reciprocal changes of only inferior ST elevation, or are a sign of "posterior" ST elevation? So how can we differentiate between inferior and infero-"posterior" infarction? 1) in the inferior leads, there is "concealed conduction". In other words, you can't see the delta wave. But if you line up lead II below V1-V3, you can clearly see that that delta waves in V1-V3 are "concealed" in lead II. I will post something on concealed conduction some time. 2) I was unclear. The excessive ST depression is definitely due to posterior STEMI. A similar situation happened to me. I had an MI in August 2015. Infrequent angina led to a Cardio Stress Test in September with no MI indications. Fast forward to November 2015 where I was hospitalized for chest pain. After detecting elevated troponin, angiography revealed a 100% stenosis of the proximal, mid, and distal LAD requiring 3 stents. And later in the same month a stent restenosis and second angioplasty. Now have LVEF at 30%. Sorry to hear. Keep biking, though.